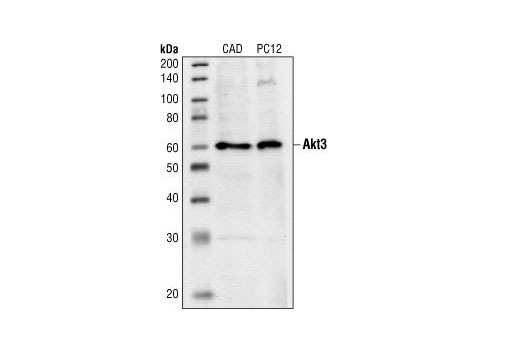 Western blot analysis of extracts from CAD and PC12 cells, using Akt3 Antibody. 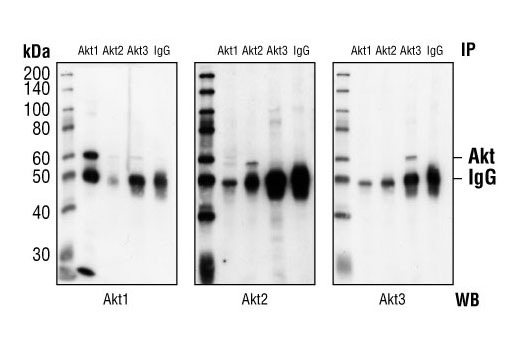 Western blot analysis of recombinant Akt1, Akt2 and Akt3 proteins, and extracts from MDA-MB-231 cells, using Akt3 Antibody (upper) or Akt Antibody #9272 (lower). Recombinant Akt3 is a 6His-fusion protein, MW=66 kDa. Western blot analysis of immunoprecipitates from MDA-MB-231 cell lysates. Akt1 was immunoprecipitated with Akt1 (2H10) Monoclonal Antibody #2967, Akt 2 was immunoprecipitated with Akt2 Antibody #2962, Akt 3 was immunoprecipitated with Akt3 Antibody, and specificity was confirmed by immunprecipitation with rabbit IgG. Immunoblot was performed using Akt1 Antibody #2967 (left), Akt2 Antibody #2962 (middle) and Akt3 Antibody #4059 (right). Western blot analysis (lane 1) and Immunoprecipitation (lanes 2-5) of extracts from HA-Akt3-transfected HeLa cells. HA-Akt3 was immunoprecipitated with HA-Tag (6E2) Mouse mAb #2367 (lane 2) or with Akt3 Antibody (lane 4). Immunprecipitation with mouse IgG (lane 3) and rabbit IgG (lane 5) confirm specificity. 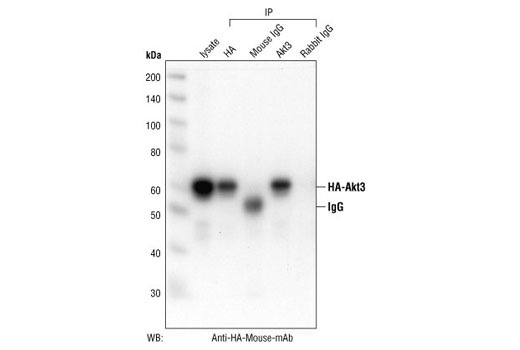 Immunoblot was performed using HA-Tag (6E2) Mouse mAb #2367. Akt3 Antibody detects endogenous levels of total Akt3, but does not recognize the truncated form of rat Akt3. 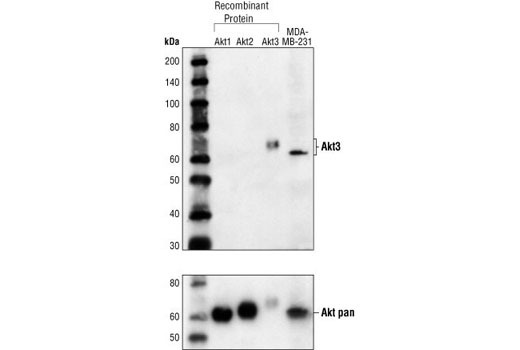 The antibody does not cross-react with recombinant Akt1 or Akt2. Polyclonal antibodies are produced by immunizing animals with a synthetic peptide corresponding to residues of human Akt3. Antibodies are purified by protein A and peptide affinity chromatography.